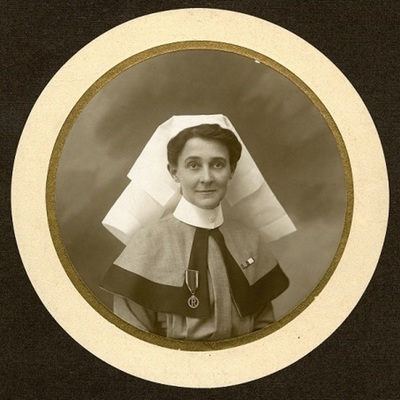 From February 1916 to December 1917, Alice Fitzgerald (class of 1906) was the Edith Cavell Memorial Nurse sponsored by a Massachusetts chapter of the American Red Cross to serve with the British Expeditionary Forces Nursing Service Reserve at Boulogne-sur-Mer Hospital No. 13 in France. Cavell was a British nurse working in German-occupied Belgium who was executed in 1915 by the Germans for helping 200 Allied soldiers escape. Upon America's entrance into the war, Fitzgerald resigned to join the American Red Cross at its Paris Headquarters. She was sent to open a Hospital in Rimini, Italy for Venetian refugees and to zone headquarters in Bordeaux. As chief nurse in the Service de Sante in Paris, she placed American nurses in French hospitals to care for American sick and wounded and inspected the hospitals to determine what supplies and equipment they needed. 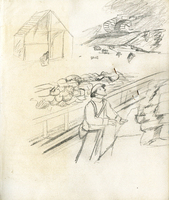 Additional material related to Fitzgerald’s postwar reconstruction work with the Red Cross can be found in the Post War Reconstruction section of this exhibit.